Then laying all night in paddy fields or on a trail in ambush." "To me, every time I read it I can almost feel being back there, except I was nineteen not twenty one the first time. I think these words reflect accurately the lot of the Infantry man in Vietnam." From the same Vietnam veteran and Museum volunteer who wrote "Memories of South Vietnam". Read memories of South Vietnam. Brigadier Bryant was a graduate of the Australian Army Staff College, the Joint Services Staff College and the National Defence College of Pakistan. He held a Masters Degree in Defence and Strategic Studies. 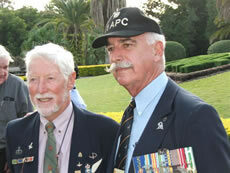 He was awarded the AM in 1996 for his contributions to the defence of northern Australia. Ian and wife Helen retired to Hervey Bay in 1997. He remained very active in local veterans and regional Legacy organisations, and restored and tuned classic MG sport cars. He was the Honorary Colonel of the 2nd Cavalry Regiment from 2001 until 2010, stepping down early to assist the formation of the RAAC Corporation. Helen Bryant has kindly loaned Ian's medals and donated his memorabilia to the museum. These mines weigh 3.5 kilograms and are initiated by pressure being placed on the three pronged igniter at the top of the mine. 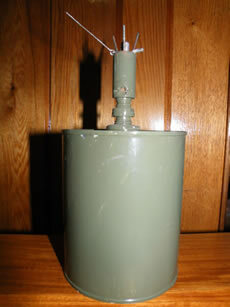 They could also be command detonated or exploded by means of a trip wire. They were also known as 'Jumping Jacks' because they leap out of the ground to approximately chest height before exploding. They have a casualty radius of 30 metres from steel shrapnel fragments. Although the mines are of United States of America origin, they were retrieved from allied minefields by the Viet Cong and were responsible for one tenth of the Australian casualties in the Vietnam War. The North Vietnamese Army were issued with sandshoes which quickly fell apart in the wet conditions. 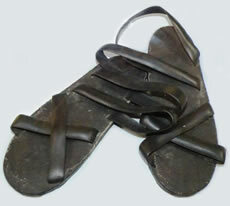 Being the masters of improvisation, they made sandals from tyres. 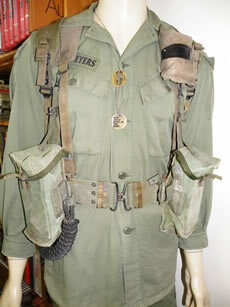 This uniform was field trialled in Vietnam in 1966. It was lighter weight cotton with the shirt cut loose to wear outside the trousers. A simple fly front, elasticised cuffs and no back pockets were changes to the trousers. Issued from 1967 onwards, although they never entirely superceded the old type. Soldiers complained that the fabric was too thin, allowing mosquitos to bite through it, therefore creating an unacceptable malaria risk. The flag championed by free Vietnamese everywhere for the first time at a ceremony marking the official recognition by France of Vietnamese unity and independence. It is a new version of a similar flag, first flown in March 1945 when Vietnam, under Emporer Bao Dai reclaimed its independence from France. 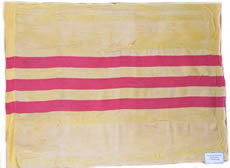 The three red-striped yellow flag continued to be the official flag of the Republic of Vietnam, which was recognised by the United Nations from 1950 to April, 1975. Today the new flag of the Social Republic of Vietnam (SRV) is a yellow star on a red background.